Dog owners in the UK are being warned about an outbreak of an animal disease that is carried by ticks. It is the first time that experts have established an outbreak of babesiosis in the country. In Essex, two dogs have died and three others needed blood transfusions after contracting the disease. Experts say that it will be impossible to stop the spread of the disease, which is caused by a single-celled parasite. 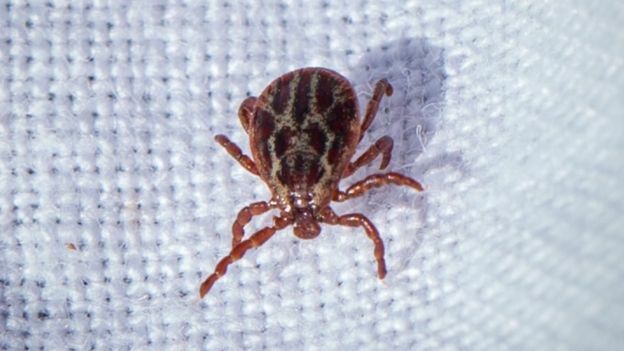 The ticks carrying the Babesia canis parasite have been found in fields in Harlow, Essex. The local council has put up a sign with a map defining the area and advising dog walkers not to enter. The expectation is that it will spread throughout the country. “At present we have a very well defined area. The problem in the future is that every female tick will lay a couple of thousand eggs and all those offspring from that disease will also carry the disease. “The only solution is to kill the ticks quickly,” says Mr Swainsbury. “Some of the tick products available will kill the tick quick enough to prevent the tick spreading the disease to the dog, because the tick needs to be feeding for 24 hours at least before it transmits the disease. “People who work on ticks and tick-borne diseases are concerned about this outbreak. It could be the tip of the iceberg. If it spreads quickly throughout the UK then it is going to be a very significant problem, but we don’t have enough info at this stage to make a prediction about how quickly this will happen. TV naturalist Chris Packham says: “The population of ticks is getting bigger year on, year on. That’s because there is better over winter survival of the adults – it’s warm and mild through our winters and that means they can breed more quickly in the spring and there are a lot more of them.